Last week we were having the implementation plan for Microsoft GP10 with Microsoft CRM4. For this we need to have the Microsoft Adaptor for Dynamics. This version 1 release of the Adapter is only for US English for use in the USA. It is not suitable for use with an International English system at this time. If you require International English, you will need to wait for version 2 of the Adapter. There is no timeframe set for when version 2 will be released. The adapter is a tool built in Web Services and eConnect – The Adapter is not a product – it is a toolset to help integrate – an out of the box, lightly extensible integration tool (at least for v1). Customers looking for Advanced Integration functionality should still look to ISV’s. The Active Directory Lightweight Directory Services role must be installed on the computer before installing the Microsoft Dynamics GP Web Service. Click Start, click Run, and then type REGEDIT. a. Right-click the registry subkey, point to New, click Key, and then name the new key ADAM_Shared. b. Open the ADAM_Shared folder. c. Right-click the ADAM_Shared folder, point to New, and then click String Value. d. Name the new string value InstalledVersion, and then type 1.1.3790.2075 as the value data. Did you know that the upcomming Outlook 2010 support 3 Exchange account to configure on a single outlook!!! As you are aware of the autodiscovery feature from Exchange server 2007, with outlook 2007, this feature has gone a far ahead to reduce the RPC over HTTPS configuration headaches or the outlook configuration for client which is part of the network and is sitting outside the firewall…good na. Here i’m talking about the server in a domain…autodiscovery works a bit different on Non-domain platform..configuration is slightly different. When you upgrade Exchange server 2007 to SP2, this is going to be a bit demanding task. clients connecting from outside and inside starts demanding for authentication…in which you need a SSL certificate with Subject Alternative Names (SAN) specified.. Separate connection settings for internal and external connectivity. The location of the user’s Exchange 2007 server that has the Mailbox server role installed. The URLs for Exchange features such as free/busy information, UM, and the OAB. Outlook Anywhere server settings. Outlook Anywhere was formerly known as RPC over HTTP. So when a user starts Outlook 2007 for the first time, they no longer have to specify any information if their computer is joined to the domain. Outlook 2007 will start, gather the information automatically, log the user on to their mailbox, and begin retrieving information from your Exchange deployment. All new style – BeyondRAID™ leverages the benefits of traditional RAID systems, while leaving many of the limitations behind. This next-generation of redundant storage technology brings together safety, reliability, expandability, efficiency and ease-of-use. BeyondRAID fits in the same place of the software stack as traditional RAID between the file system and the driver. Hence, BeyondRAID can be adopted without any change in infrastructure, allowing you to maintain your current file system and operating system, while eliminating the friction costs typically associated with moving to a new technology platform. 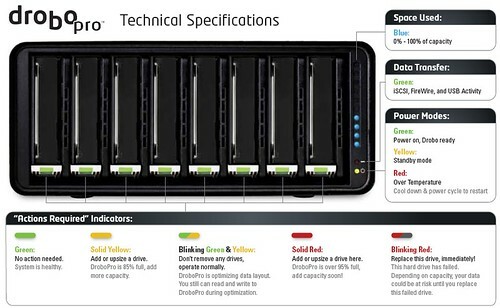 They now release the new system which is Drobo Elite..Dual High-Speed iSCSI Interfaces It’s an industry- standard, high performance protocol that has become extremely popular with businesses and individuals who demand high data storage throughput, but it can often be complex to manage. DroboElite changes that by introducing zero- click iSCSI connection creation with optional LUN-level CHAP authentication for both Windows and Mac OS X.